Whether you’re suffering from repetitive stress injuries, back pain, or just want to have a healthy office environment, a good chair is a must. This is especially true for writers, programmers, and other folks who spend the majority of the work day at the computer. There are a lot of ergonomic chair options out there, and it’s hard to say that any one particular one is best, so it depends a lot on what you’re looking for and what price range you’re looking in (it’s entirely possible to spend $1,000 or more for an ergonomic chair!). 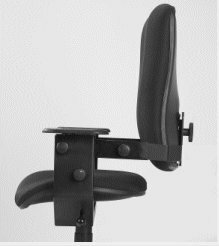 Today I came across one I haven’t written about before: the SwingSeat from SmartMotion Technology. The picture here doesn’t look all that impressive, so I suggest you take a look at the company’s website, where there are a few videos of the chair in action. Basically, the back piece and the seat piece can both rock (tilt forward and back) in response to your shifting weight. If you’ve ever experienced pain or stiffness after getting up out of a chair, then this might be just what you need. I’d think the regular movement would help keep your muscles from getting cold and stiff. The SwingSeat seems to be targeted at those with back pain, though I suspect anyone might enjoy these features. New chairs start just under $400, and the company also has some “like new” demonstrator or refurbished chairs you can pick up for a lower price.